Answer: There are no hook restrictions for halibut, so the lure you have described would be legal to use. 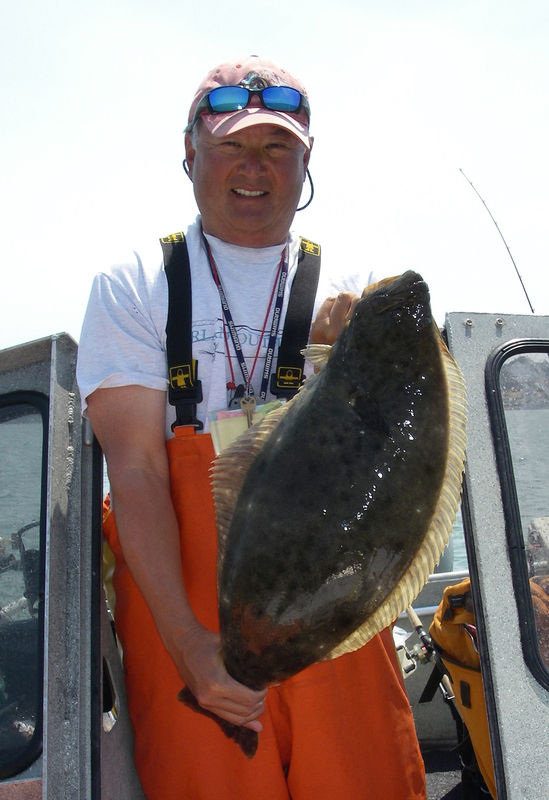 However, according to our halibut program expert, Department of Fish and Game (DFG) Associate Marine Biologist Travis Tanaka, you should remove one of the treble hooks. There are two reasons for this. First, a hooked fish would be safer to handle because you wouldn’t have the additional hooks (not hooked in the fish) possibly hooking your clothing or skin. Second, short fish would be easier to release because again you wouldn’t have to worry about the additional hooks catching where you don’t want them to. We recommend a soft, knotless landing net. Sublegal-sized halibut landed with this type of net don’t fin split (damage their fins) and they will have a greater chance of survival when you release. Answer: DFG makes no recommendations in support of any particular guide or hunting service. Hence, your best bet is to contact other hunters to ask about their experiences in order to help you decide which guide service to go with. According to DFG’s Bear, Mountain Lion and Wild Pig Programs Statewide Coordinator Marc Kenyon, you can hunt on certain government-owned (public) lands in California. Public lands in California are primarily owned, operated and maintained by DFG, the U.S. Forest Service, the Bureau of Land Management (BLM), the Department of Defense or the U.S. Fish and Wildlife Service (USFWS). Each of these agencies has developed rules and regulations for the lands they administer. They provide details of which lands are open to public access for outdoor recreational activities (including hunting), and the time of year they are open. Some of these lands are open year-round with no access fees, but some lands are open only certain times of the year with an access fee. Moreover, some public lands are entirely closed to all public use, mostly for protection of certain plant and animal species. Generally speaking, most big game mammal hunting occurs on DFG, BLM, Military or Forest Service lands. Small mammal and varmint hunting occurs on BLM and Forest Service lands. Waterfowl and upland game bird hunting occurs on DFG and USFWS lands. For the regulations governing the use of DFG lands, please go to http://www.dfg.ca.gov/lands. Please contact the other land management agencies for rules or regulations concerning their lands. Answer: In ocean waters it would be legal to gaff a legal size salmon pursuant to the California Code of Regulations Title 14, section 28.65(d), but you must still have a landing net that is at least 18 inches in diameter on board to land any undersize fish. In inland waters, CCR Title 14, section 2.06 makes it illegal to use or possess a gaff throughout California with one exception, which is a section of the Sacramento River below the Deschutes Road Bridge where gaffs three feet or less in length may be used to land legal sized fish. This exception only applies to anglers fishing from a boat. This entry was posted in Hunting, Info, Methods Of Take, Tackle and tagged deer hunting, firearms, fishing tackle, hunting, ocean fishing, regulations. Bookmark the permalink.